How to Insert Date and Time in Microsoft PowerPoint 2013 Presentation? This article will explain how to insert date and time in a presentation file in Microsoft PowerPoint 2013. 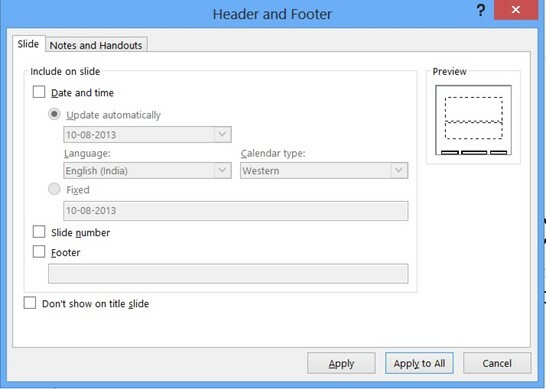 There are multiple ways to insert date/time in a PowerPoint presentation in Microsoft PowerPoint 2013. Follow the below steps to do it. 1. Launch Microsoft PowerPoint 2013 and open the presentation file. 2. Navigate to the Insert Tab and from the Text group, click Date & Time. 3. This will display the “Header and Footer” dialog. Enable the “Date and time” option and then select the date format. 4. Click “Apply to All”. This will insert date and time on all the slides.